Russian Kashtan class buoy tender KIL-158 passing through the Bosphorus today. She is heading to Greece for an official visit. 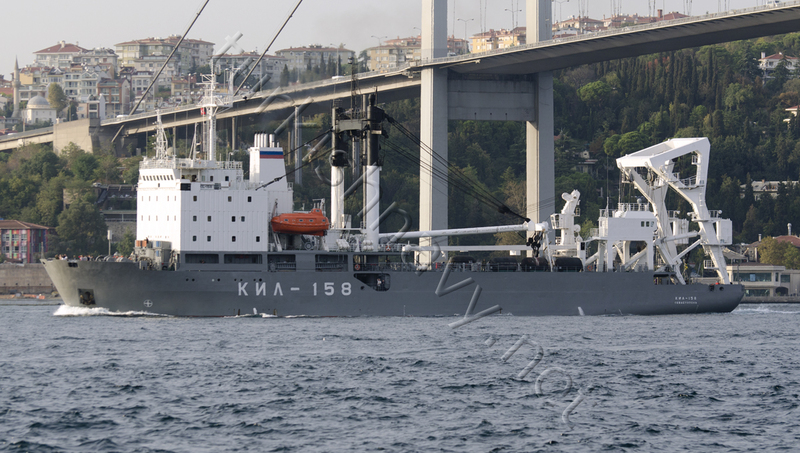 Today, the Russian Kashtan (Project 141) class buoy tender KIL-158 passed through the Bosphorus on her way to Greece. According to flot.com the ship will attend the Russian Week In the Ionian islands. Black Sea Fleet mooring tenders KIL-158, visit the ports of taps with the business of the Hellenic Republic, where Russian sailors will participate in the activities of the XII International Public Forum “Russian Week in the Ionian Islands” and the celebration of the anniversary of the naval battle of Navarino. expected that the ship will go to the island of Corfu , Lefkada, Kefalonia, Zakynthos, as well as the ports of Pylos, Patras and Piraeus. To participate in the activities on board the ship at sea will leave the orchestra musicians and Song and Dance Ensemble of Black Sea Fleet. safety of the ship crossing the sea and in port will provide military marine brigade’s Black Sea Fleet. KIL-158 Exit from Sevastopol is scheduled for September 29. large landing ships (BDK), Black Sea Fleet, “Yamal”, which was previously planned to participate in activities campaign, put other tasks on the destination. The Ropucha class large landing ship Yamal was originally tasked to attend the Russian Week but apparently she is keep for more important missions like showing the flag off Syria. One does not simply send an ungainly buoy tender to a foreign country for port visits but a more elegant and impressive warship. The Russians know this fact by heart as they use their navy as a political instrument very masterfully. So if Russians are sending a buoy tender to Greece does it mean that keeping a large task force in Med is taking its toll in terms of readiness and deployment schedules? Don’t you think you have been posting too many Russian movement news lately? Don’t misunderstand me they are good as information but I would prefer you to update a post about russian movements instead of flooding with new posts. Maybe you can put your list of rusnavy warship movement to right frame and update accordingly?